Spring arrives and the warming weather encourages the plants in our gardens and parks to burst into life, commencing their annual reproductive cycle. Plants use cues from the weather and climate to time their growth, flowering and fruiting. But as the world heats up due to climate change, these patterns are changing. So how is climate change affecting our gardens, and what can we do about it? Many temperate plants have evolved to reproduce in spring to avoid damage from extreme cold or heat. Warmer conditions tend to speed up these processes, causing plants to grow faster. Plants have evolved sophisticated mechanisms to synchronise with climate. This means they are excellent bio-indicators of climate change. We know from global assessments that most plants studied so far are behaving as we'd expect them to in a warming world. Studies in the Southern Hemisphere have found the same. In Australia, plants in southern Australia are maturing earlier – winegrapes, for instance, by 27 days on average between 1999 and 2007. We can see this in wine growers' records. 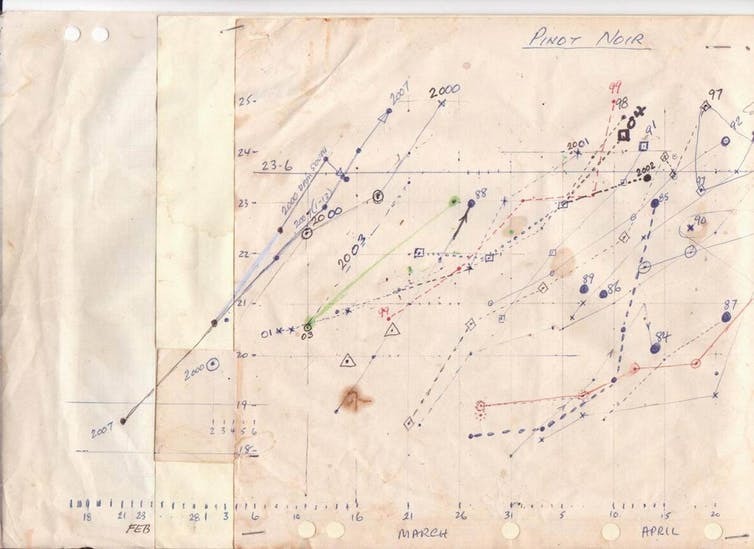 As you can see in the handwritten chart below, wine grapes are on average maturing (measured by their sugar content) earlier. Other plants may behave differently. Fruit trees such as apples need cold weather to break buds from their dormant state, before commencing growth when warm temperatures arrive. This means after warm winters, such as this one, flowering may actually be delayed. 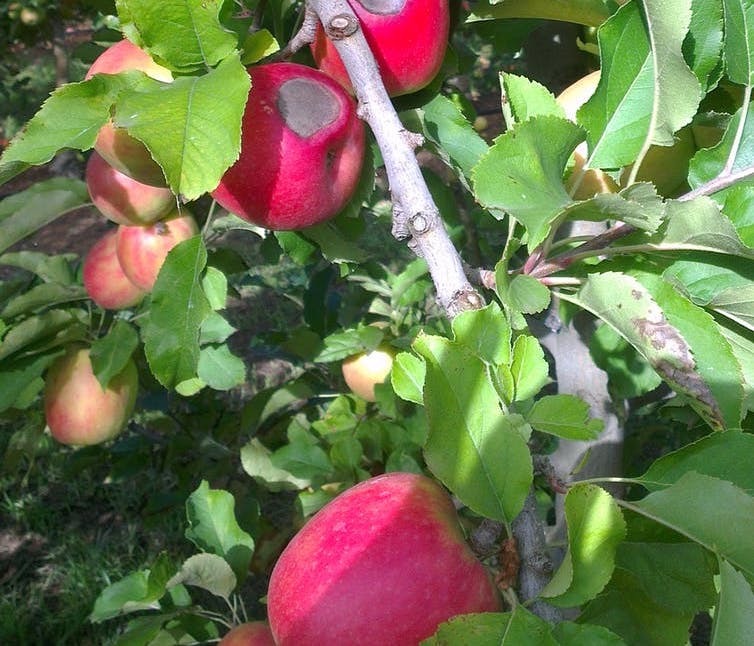 Data from a recent study show potentially delayed flowering for Pink Lady® apples, as you can see below. In the examples above, Applethorpe had the warmest spring and flowered first, as we'd expect for most plants. 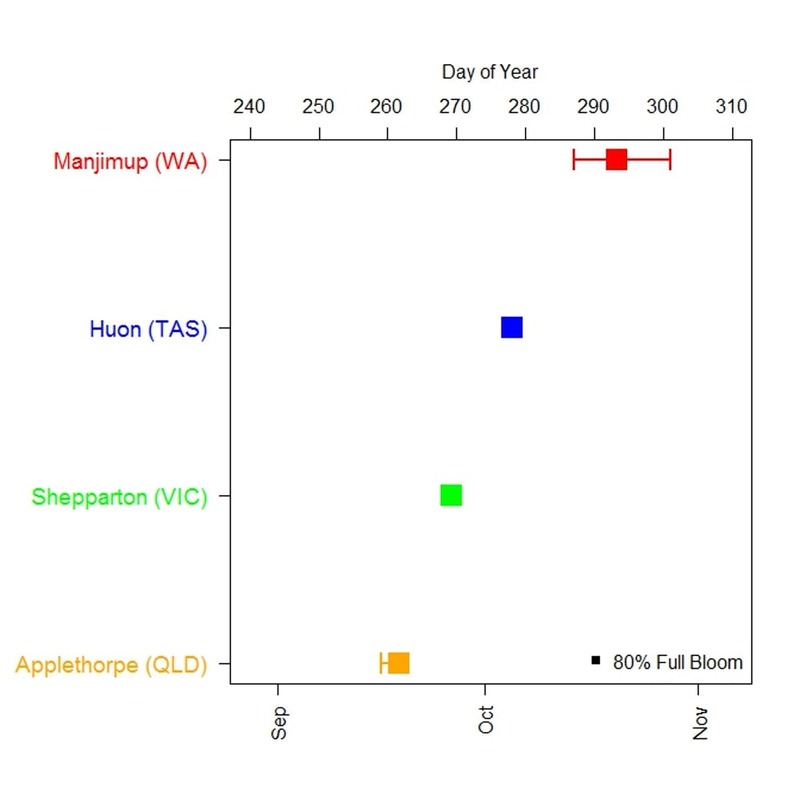 But Manjimup had the second-warmest spring and flowered last, even after Huon, the coldest spring site. This seems counter-intuitive but the delay is likely because Manjimup had the warmest winter. The earlier emergence of reproductive tissues may increase the risk of devastating frost damage. Contrary to what you might expect, evidence shows recent warming in southern Australia has not necessarily led to fewer frosts. On the other hand, plants that delay flowering because of warmer winters may reduce their frost risk. Shifts in flowering timing, earlier or later, can be problematic for plants that rely on pollination between different varieties. Both varieties must shift flowering in the same way for flowering periods to overlap. If flowering times don't overlap, pollination will be less successful, producing fewer fruit. Bee and bird pollinators must also adjust their activity in sync with changes to flowering time to facilitate pollination. Faster maturity may shift ripening into hotter times of year, as seen for wine grapes. This increases the risk of extreme heat damage. Pests and diseases will also adjust their growth cycles in response to a changing climate. One pest well known to gardeners is the Queensland Fruit Fly (QFF). Their maggots are found in a wide range of fruits. Climate change will likely favour fruit flies. Warmer temperatures for longer periods will encourage a higher number of generations each year. Meanwhile, reduced cold weather will mean fewer fruit flies will die, increasing the flies' survival rates. On the other hand, temperate pests and diseases may decrease if warming exceeds their temperature thresholds. What have you observed? Citizen scientists who track the timing of biological events have provided valuable information, especially in Australia, for us to monitor and interpret plant responses to climate change. Keeping garden records will show if and how your plants or pests are changing their patterns. If you observe your flowers emerging earlier, coverings can be used to protect against frost. Keep an eye on cross-pollinators – are they flowering together? If not, consider planting a different cross-pollinator. Nets are an effective way to reduce heat damage and can also be used to protect against some pests. Setting pest traps according to weather rather than the calendar will help disrupt the first generation and reduce pest impact. Climate change has already influenced biological responses, perhaps even in your own garden. Seeing these changes in our gardens gives us an insight into the significant challenges faced by our food production systems under a changing climate. Adapting to current and future climate change is a reality, and is essential to preserve both the enjoyment we experience in our own gardens and the security of future food supply.